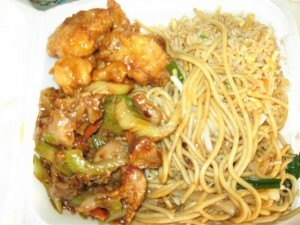 Chicken Chowmen recipe by samar ali at DesiRecipes.com. In a large bowl let the macroni boil add 1tb spoon of oil and 1 tb spoon of salt while boiling. Finely cut the carrots, capcicum and fry them untill they become tender then cut the boneless chicken in fingers and add them into the fried vegetables. Then add all salt , black peper, red chilli, soya sauce and ajinomotto in the stuff and stir well. Then add the rice in it and finally add the boiled macrona in it. Serve it hot and with ketchup and hot sauce.